Dorzolamide HCl is a water-soluble, potent inhibitor of human carbonic anhydrase II and IV with Ki of 1.9 nM and 31 nM, respectively, used as anti-glaucoma agent. Topiramate is a mutil-targeted inhibitor, including voltage-gated sodium channel and calcium channel, AMPA/kainate receptor and carbonic anhydrase, used to treat epilepsy. U-104 is a potent carbonic anhydrase (CA) inhibitor for CA IX and CA XII with Ki of 45.1 nM and 4.5 nM, respectively, very low inhibition for CA I and CA II. Regression coefficients from the second-order stepwise linear regression model are provided based on the data obtained from Search 2.1 (B) The results allow the least effective compounds to be eliminated. 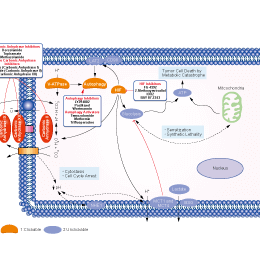 Red is used to highlighted drug contributions that do not help to inhibit cell viability, orange bars are used to indicate minimal contributions and green highlights synergistic drug interactions. The inset in B shows the linear fit of modelled data with theoretical quartiles versus standardized residuals and the corresponding R2-values for each model. Significance is indicated by asterisks, **p < 0.01 and *p < 0.05. Methocarbamol is a carbonic anhydrase inhibitor, used as a central muscle relaxant to treat skeletal muscle spasms. 2-Aminobenzenesulfonamide is an inhibitor of carbonic anhydrase IX. Dichlorphenamide is a sulfonamide and a carbonic anhydrase inhibitor of the meta-Disulfamoylbenzene class. Brinzolamide is a potent carbonic anhydrase II inhibitor with IC50 of 3.19 nM. Methazolamide is a carbonic anhydrase inhibitor with Ki of 50 nM, 14 nM and 36 nM for hCA I, hCA II and bCA IV isoforms, respectively. Mafenide is a sulfonamide that inhibits the enzyme carbonic anhydrase and is used as topical anti-infective, especially in burn therapy. Mafenide Acetate is a sulfonamide that inhibits the enzyme carbonic anhydrase and is used as topical anti-infective, especially in burn therapy. Acetazolamide, a potent carbonic anhydrase (CA) inhibitor, is commonly used in clinical practice as an immediate and readily available option for acute reduction of intraocular pressure(IOP). Benzenesulfonamide ia an inhibitor of carbonic anhydrases.